How can we ensure we do that? This post tells us how. It explains how we can remain fervent in our worship and service to God regardless of our circumstances. It appears that the faith of many is dependent on their physical and material circumstances. As a result, many call on God and cling to Him when they are sick and things are hard but forget or ignore Him when they are healthy and prosperous. We see this everyday. Many physically fit people worship their bodies as though their vitality will last forever, forgetting the God who gives them life and strength. Similarly, many rich and famous people will laugh you to scorn if you tell them of their need for a Saviour. They feel self-sufficient, revelling in pride because of their accomplishments and public adulation. The poor, on the other hand, fill church pews and spend many hours praying (in day time and in vigils). They attend almost every church and fellowship programme, they serve tirelessly and look up to God for a breakthrough. I’m not suggesting that church activity is a very good indication of devotion to God. We may seem to be busy for God while being personally disconnected from Him. But the person so serving is obviously doing it to show his or her faithfulness to God. The sick also call on God ceaselessly and seek prayer from many sources. I’m grateful to Jo and Leisa for having me over at the their Penny Pinchers’ Paradise to share this. May God bless them, their families, jobs and ministry abundantly in Jesus’ name. True, true and true... Many wealthy men have forgotten their root and provider of their wealth, some don't even attend the normal Sunday services any longer all in the name of business trips and tight schedule, same people will be sleeping in church when things start going wrong. We're really not eager to apportion blames but to provide guidance to those who come by, hoping that by heeding it they will prosper both spiritually and otherwise. Bless you! The post is a reality and depicts what happens in our society as regards the way we serve God. Some are true worshippers of God, while some worship based on the situation they find themselves in and if they do not see any reason to serve him, they tend to forget that he (God) ever exists.some actually remember him when they are in need of something and the moment they get those things they cease to serve him. most wealthy people find it difficult to partake in discussions concerning God and to even engage in religious or Gods activities or even to enter the house of God to praise him, they attend the house of God only when they want to make donations and after that you will not see them again. their excuse is that they always have tight schedules concerning their source of living. the same thing applies to the poor in the sense that when they ask God for something and they do not get it immediately , they tend to sort for a way out in other source forgetting God. they cease to persevere in their worship of God which is an indication that their service to God is never real.But there are people who are still faithful to God in their worship. Thanks a lot, Ginika! You are sooo blessed! when people get wealthy sometimes they use work as an excuse, but the still have time to take care of themselves ,really a true believer should understand the source of the money and try to acknowledge God fully. Yes, we owe God adoration and worship no matter our circumstances. Thanks a lot and remain blessed. Truly, people tend to draw close to God when they are in need, but as soon as they get what they want, they become so occupied that even a song of praise to show gratitude for His blessings becomes difficult, let alone attending a fellowship in His presence. Remember the rich fool who thought he had it all forgetting that his life is in God's hands. Scary, that story about the rich fool! May God deliver us from such folly in Jesus' name. This is where 'Human nature' comes in. I think what we need now is the Grace to serve God in faithfulness, not just in trials and tribulations, Also in our little period of enjoyment, fulfillment, prosperity............. Because nothing, they say, lasts forever. It's a privilege to relate with God. May worldly pleasures and attainments never make us forget that in Jesus' name. The veracity of this post is beyond every realm of doubt. Our attitude in worshipping God is often one-sided, in the sense that we cling to God in critical situations of life and fail to revere and worship him in truth and spirit when our pleas and needs are answered and granted. We need to restructure and reorient our attitude towards worshipping God. Nicely said. God bless you bountifully in Jesus' name. The weeds choke out the wheat like the cares of this world strangle the wealthy spiritually. I have known far more miserable wealthy people than happy. So sad! Thanks a whole lot, Alice! Yes oooo! it's true. Most times, we remember God when troubles arise but when it seems like the worst is past or that everything is going well, we forget about Him. It can be quite easy to let our material riches distract us from God and all that He does for us. We don't really need to be so wealthy or have the flashiest cars and many mansions. No! He gives us life and provides for everything we need and for this, we must try always to remember Him in our lives by doing His will at all times, even when it's not easy. Thanks a lot, Onyinyechi! I agree with you. This is indeed motivational. We should remember God both in good and in bad times. We should not concentrate more on him during trials and tribulations. Nice one, MA! Well said, Somtochukwu. You are blessed! i must say you're blessed. thanks so much for discussing this topic with so much passion and grace. i am personally blessed. may God bless you richly. The main point I got from this post is our motive of serving God. Is it for examination success, wealth, good health, spouse, etc. If these are your motives/aims of serving or worshiping God, then I must tell you that you are worshipping the material world and not God. When all these aforementioned are already there or provided, you may cease to worship God. The Bible says that we should first seek the kingdom of God and every other thing will be added unto us. If one fervently serves God, all the goodies will automatically become his. Seriously, we humans are so addicted to material things forgetting that God knows our mind ,some of us don't know that before we seek for something God already knows the feedback he will get so why deceive ourselves. so it's very simple give to God what belongs to him and get what you need as a living being ( praise and worship him for there is no one like him and not only when You are in need). This is religiously educative, we should always worship God with our whole heart, he doesn't want our food or money, no matter the circumstances, no matter how rich or poor you are, just always remember him in everything you do in this life, try to please God, not man. I love this ma, you are truly the servant of the most high. Glory to God! I appreciate, my dear. You will go,places in Jesus' name. Of a truth ma, sometimes people forget that faithfulness to God entails loving Him at all times and not blindly serving Him for material gains. This post charges Christians to be fervent and faithful to God, when all is going well and not. as christians, we should know our father and continue to serve him in good and bad times not only when we are in need. as christians we ought to deviate from such traits. Serving God should be a lifestyle and not because we desperately want something from God. Thank you for this message, God bless you Ma. It is a wonderful thing to serve God no matter the situation. It is a strong decision to make and not because of what we want from him. Thank you for helping me make this choice today ma'am: to be faithful even while flourishing, to remember that every good thing comes from the Lord who has seen it fit to bless us. I pray for a heart like king David's and for a love that is pure and true, one that hath no season. May the vanities of this world never corrupt my heart or make me lose sight of the unadulterated joy being in His presence gives. Amen. I am positive that by God's grace others who read this post will come to this decision too. You're blessed, aunty. Our faith should not be built on material circumstances,we should channel our faith towards God because he will provide for us according to his riches in Glory. This is exactly the thing happening in a Christian's life, when he or she has a problem, then he remembers there is God but immediately the problem is solved, he or she forgets that God exists. Thanks ma for this post, i really appreciate. this motivates my spirit ma,it makes me to have a re-think of who i take God as,a father,a person i run to in my time of need an distress,or do i have this personal relationship with him as the one that died for my sake.all i can just say is thanks for this piece of writing. True words! We can actually be faithful while flourishing if only we can acknowledge our maker, our creator, our provider and the whole essence of our being. If we learn to say thank you lord and do those little things that matter, we can also be faithful while flourishing. Aunty, thank you for this write up. God bless as you keep up the good work. This post admonishes us to always seek God even when all things are going well or not. How would we like it if someone only comes to us when they're in need? It's not right and so we shouldn't take God for granted. The Bible says, "do not lean on your understanding but in all thy ways acknowledge the Lord". Do not let the things of this world make you forget your heavenly father. In every situation of our lives, we should always acknowledge Him, both in times of good and bad. Although it might seem difficult, never stop seeking God. Bless you, ma! This is an eye opener and a reminder to us Christians. Many times, we cry out unto God for help just because we are in a tight corner. But immediately after the request has been granted, we forget the existence of God faster than the problem itself. Christians of nowadays rarely worship God truly for who He is, which is what we are required to do, what we are supposed to do. We are not meant to remember God just because we have problems that need to be solved. Nice work, Ma. Whwn we seem to be benefiting , flourishing or prospering; we need not forget that whatever we may be , it's only because he wills it allows it and gives us the life to enjoy it. This is a motivational post. We should remember God both in good and in bad times, we should not concentrate more on him during trials and tribulations. riches and prosperity should not becloud one's sense of devotion to God. This is indeed inspirational,worldly pleasures should not make us to forget the Almighty God whois the creator of all things. Its termed 'normal' when one is in need and draws so close to God and also normal when the rich and affluent draws farther. This notion needs to be changed as its sweeter serving God in riches. We all know the truth. Life is filled with pretense and deceit. Even when the poor class acquire or accumulate what they want, they intercept the bond they were sharing with God initially. But most importantly, we should try as much as possible to always adjust and make fast decisions when ever we find ourselves breaking such chain. This is so true, many people remember God only in their times of need and when God finally blesses them, they would forget to thank him or even acknowledge him. But there are some people who always remain faithful to God even after being blessed. Wonderful story......it is indeed important for us to call upon God without ceasing. Self-indulgence often plays in our lives when we fall into good times. Many a times after a breakthrough, we tend to forget the one (God) who made it possible for us and that's not a good attitude of a faithful worshipper. Am guilty of this. Very true ma!most at times we spend night and day in the church seeking and praying for a miracle or breakthrough but when it finally comes people feel self sufficient and even forget to appreciate God,the giver of all. Being faithful to Christ pays, when He gives you something try and Give Him back what you promised.Faithfulness. We should always try to be faithful whether we are flourishing or not, so many christians only run to God when they have problems and immediately the problem is solved then run away from God. We have to be consistent in worshipping God because even the bible says we should worship him in truth and in spirit. 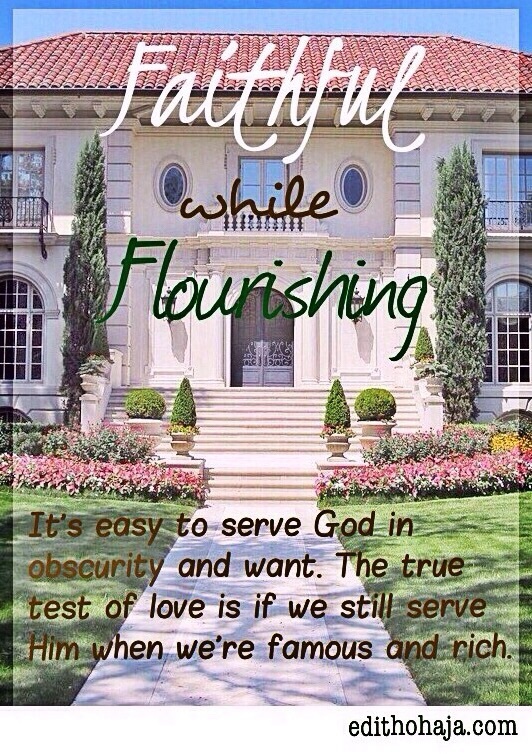 Indeed, “The true test of love is if we still serve Him when we’re famous and rich”. Not when we are in need of his help. It is quite disheartening that many people forget their God immediately thy get what they want from him, whereas they were once everywhere around the church in times of need. I pray that God gives us the grace to persevere in serving him even in times of wealth and affluence. We came with nothing and we will also go with nothing. What shall it profit a man to gain the whole world and suffer the lose of his soul? Let us not remember God only when we are suffering, he is our protector who also protects our wealth, whatever you have today is from him. Do not allow the earthly thing you have (money) to deceive you. Nice one ma.